“Ach,” says our taxi driver, coming to a stop, “there she is – God’s own austerity bomb.” We all watch in silence as the sun gradually breaks free from the wall of Glaswegian cloud that had been smothering it for the past three days. It throws its watery beams over the Tramway arts space – the post-industrial cathedral on the South Side of the city that’s been selected to host 2015’s Turner Prize. “That’ll be four quid thanks ladies” – the driver’s ‘weegie’ accent starts us out of our joint reverie, and we pay up, more than happy to line the pocket of yet another taxi driver whose dry wit means we enjoy our journey as much as the works they take us to see. This is one of the last stops on our little art jaunt around a city now renowned for its cultural punch. A wee tour of Glasgow with art as its backbone gives us a taste of how endlessly multiplicitous the place really is: from the palatially-proportioned Kelvingrove (the UK’s most visited museum outside London), constructed in that Locharbriggs red sandstone that screams Glasgow from every block, to the rough and achingly contemporary spaces that dot the Argyle Street area. It’s this part of the east end of the city that tends to get arty types all hot under the polo neck, so we make it one of our first destinations. The converted shopfronts of the Market Gallery, Mary Mary, Transmission and an impressive number of others all share a bare concrete aesthetic and are stuffed full of slickly presented shows that show off Glasgow’s much-talked about artistic energy to the max. We’re initially quite taken aback when the gallery assistants smile and say hello instead of peering down their horn-rimmed spectacles at us af it we’re about to vandalise something, as they so often do in London, but we soon relax into it. While we’re here, we pop into the fish market-turned artists’ studio complex at The Briggait to do a bit of talent-spotting. As with so many of the converted buildings we’ve encountered here, the project – finished in 2009 – is impeccably done. The dour stone of the old neo-classical structure looks elegant and content framing the contemporary glass facade. In the epic space where Glaswegian fish sellers once hawked their wares, an installation by artist Stephen Murray inspired by the velodrome at the recent Commonwealth Games sweeps around the space, dominating and reflecting on it. After a hard day gallery stomping, it would be rude not to whet our lips at one of the bars frequented by the city’s art crowd. At the Old Hairdressers, we yell our drinks orders to a bar woman with a studiously unkempt haircut that makes her look somewhere between an elfin and a tramp. We end up having lots of shouty and gradually more enthusiastic conversations with local artists and trail back to the hotel in the early hours, by which time the streets are full of groups of red-faced revellers slurring serenades at no-one in particular. I try to join in but I don’t know that words. In the morning, we walk through the majestic Kelvingrove park to the posher West End for a traditional Scottish breakfast at Stravaigin’s restaurant. This is on the recommendation of a regular, and we’re hugely grateful for it. We’ve found the food scene here to be a little on the patchy side, so it’s a relief to be served a gourmet version of the intense, salty meat-hit that we so associate with Scotland. The black pudding and plump sausage soaks the night at the Hairdressers up like a dream. 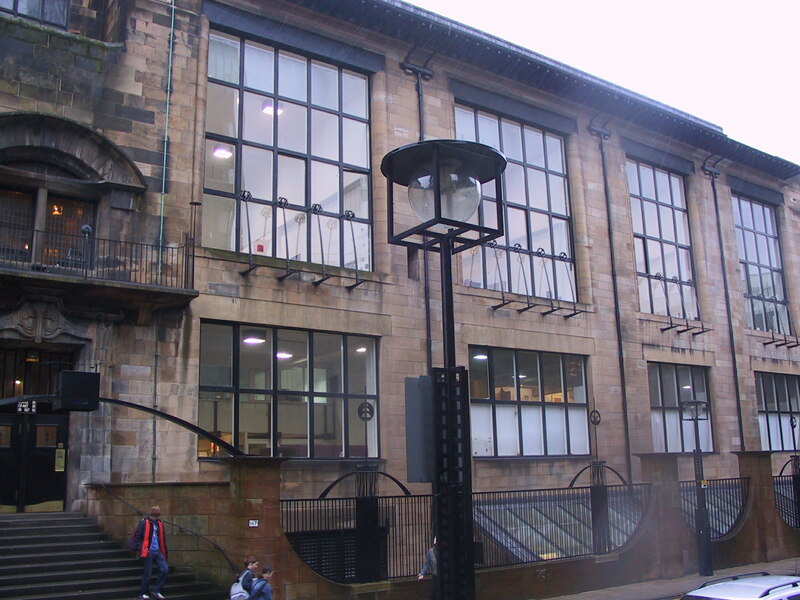 We leave our visit to the Glasgow School of Art till last, and the thought of all that cultural incineration brings more than a few tears to our hungover eyes. Mackintosh’s seminal building is still as proud and majestic through it all, but it feels a little as if we’re intruding on a noble king in the midst of some traumatic surgery. The tall windows of the north-facing studios are just about visible through the charred remains, bringing to mind all the art that was destroyed. It all gets a bit much for us. Zapped, we trail back to the mindblowingly cheap but central hotel that’s been our shoebox-esque home for the last four days. There is something unavoidably irritating about waking up with my (admittedly tall) friend’s hand in my mouth because our ‘twin’ beds are four inches apart; having to run down the suspicious-smelling stairs at all hours because the oh-so-tech card keys have stopped working again; and not being able to shower our bodies that are oozing whiskey the morning after the night before because the hot water has stopped working. But all this is tempered by the unerring loveliness of the two red-headed women at reception, both of whom have the most brilliant of Scottish blue eyes that seem to hypnotise us into acquiescence. “Will ye be back?” they ask cheerfully, as we drag our unwashed selves and unwieldy cases down the fragrant stairs. We nod enthusiastically. Maybe we’re a bit late to the party, but Glasgow and its art scene has us thoroughly enthralled.